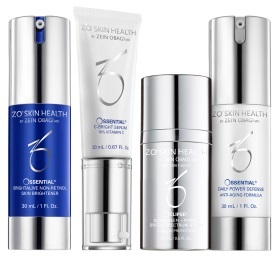 Founded by Dr. Obagi in 2007, ZO Skin Health, Inc.® was created to provide physicians and patients with the world’s most innovative and effective skin health solutions. As Medical director of ZO Skin Health INC.®, Dr. Obagi has created products with technologically advanced ingredients and even more effective formulations, designated into two categories: ZO® Skin Health and ZO® Medical. ZO® Skin Health products maintain the results of therapeutic treatments and provide effective daily skincare and protection from the environment, while ZO® Medical products have been optimized to treat a range of skin disorders and chronic conditions. Pre/post-procedure skin conditioning: Provides improved outcomes and longer-lasting results when used 4-6 weeks before in-office procedures and 12 weeks afterwards. General skin health restoration: Improves the overall quality, health and appearance of the skin. This skin brightening program is specifically designed to brighten skin tone and lessen the appearance of discoloration. Stabilized vitamin C promotes a more even skin tone and minimizes the appearance of lines and wrinkles. Mild enough for everyday use. This program also reduces the appearance of fine lines and wrinkles. Invisapeel Intensive Resurfacing Peel utilizes a mult-targeted plant enzyme formulation to break down the stratum corneum and help stabilize the epidermis for smoother, firmer and brighter skin. The peed addresses a wide range of conditions including uneven texture, acne, PIH, flaky skin and visible signs of sun damage. This targeted acne and brightening treatment offers rapid relief from acne lesions and post-inflammatory hyperpigmentation. It features LiquiPatch technology and rollerball application for clean, easy and superior application penetration. This corrector and concealer provides long-lasting matte coverage with a targeted spot treatment that attacks acne to clear up active breakouts. Our triple-action nourishing complex keep skin hydrated while helping to prevent post-acne marks. Advanced phyto-technology also helps calm and soothe red, irritated acne lesions. This fresh-foaming formula contains glycerin, meadowsweet and green tea. It deep cleans pores and dissolves excess oil with hydrating, anti-inflammatory and anti-oxidant benefits. This skin-smoothing scrub contains ultra-fine magnesium crystals to exfoliate dead skin cells and increase epidermal turnover for a clear, smooth and even-toned complexion. Vitamins A, C, E, and C esters provide antioxidant benefits to help maintain the skin’s barrier function. A MUST FOR EVERYONE! Time-released retinol, antioxidants and specialized DNA-repairing enzymes work around the clock to help minimize UV oxidative damage and uneven pigmentation. They also help restore skin function and elasticity while stimulating collagen production to help diminish fine lines and wrinkles.